Do you remember Aaron Kinebrew? Aaron Kinebrew graduated in 1987 and was inducted into the Hall of Fame in 2019. 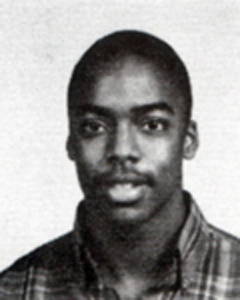 Aaron Kinebrew, 1987: Aaron was an outstanding running back and track sprinter. In his junior and senior years, he was All Eastern Metro League and All City, and was All State as a senior. When he graduated, he had the most career rushing yards, most career kick-off return yards, and the most kick-off returns for touchdowns in Withrow’s history. He played in the Southwest Ohio All Star games as a senior. In track he would run in four events, including the 100M, 200M, and sprint relays. He ran a 10.8 in the 100M and was captain his senior year. He accepted a full scholarship to Kent State University, where he played running back and returned kicks for four years. He was one of the top Division I kick-off returners in the country. When he graduated, he held Kent State’s record for most kick-off return yards in a season and most kickoff return yards in a career.